Jaguar North America is kicking off the Jaguar Electrifies Experience, a multi-city national tour, in San Francisco this week. To mark the premiere of the Experience, Jaguar has launched a marketing campaign across the San Francisco that includes billboards and branded VOLTA charging stations, as well as local vendor integrations. The Jaguar Electrifies Experience is designed to engage, entertain, and educate consumers on the full Jaguar vehicle lineup as well as the benefits of owning an electric vehicle (EV). Following the premiere event in San Francisco, Oct. 3-7, the Experience will travel to key U.S. EV markets: South Florida, Los Angeles and the New York City metro area through spring 2019. 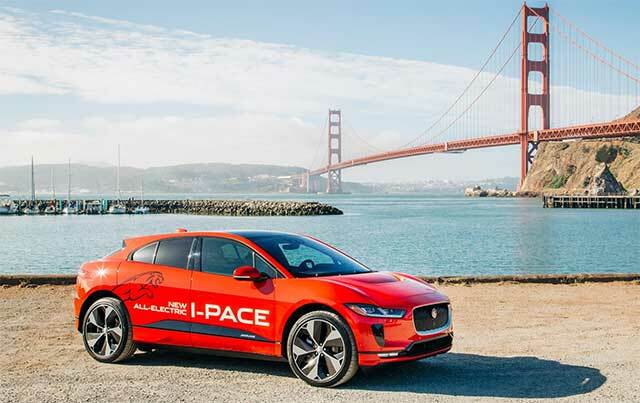 To promote the Experience, Jaguar has been the exclusive advertiser on a series of digital VOLTA EV charging stations in the Bay Area that are offering free electric vehicle charging. There will be an example of a VOLTA EV charging station at the Jaguar Electrifies Experience. VOLTA Charging is based in San Francisco and is the largest free EV charging network in the U.S. with infrastructure in major cities across the country. The brand is also working with local Bay Area vendors to offer attendees at the Experience flavors of the city with a selection of food and beverage options from local favorites including Dynamo Donut, Ghirardelli, Philz Coffee, Blue Bottle Coffee, Harmless Harvest juices and Alameda craft soda. Attendees will also be able to enjoy some of the city’s best indulgences, including breakfast from Jane, and macaroons from Chantal Guillon. The experience will conclude in “The Electric Lounge” which will feature some of the industry’s most cutting-edge products and technologies curated by media partner WIRED, including Smart Mirror Touchscreens, DJI Mavic Air Drones and a Live Drone Feed of the closed-circuit driving test course. In addition, guests will be able to participate in various augmented and virtual reality activities that can be shared on social media.